A finalist for the Kirkus Prize, Andrew Carnegie Medal, Aspen Words Literary Prize, and a New York Times bestseller, this majestic, stirring, and widely praised novel from two-time National Book Award winner Jesmyn Ward, the story of a family on a journey through rural Mississippi, is a “tour de force” (O, the Oprah Magazine) and a timeless work of fiction that is destined to become a classic. Jesmyn Ward’s historic second National Book Award–winner is “perfectly poised for the moment” (The New York Times), an intimate portrait of three generations of a family and an epic tale of hope and struggle. “Ward’s writing throbs with life, grief, and love… this book is the kind that makes you ache to return to it” (Buzzfeed). Jojo is thirteen years old and trying to understand what it means to be a man. He doesn’t lack in fathers to study, chief among them his Black grandfather, Pop. But there are other men who complicate his understanding: his absent White father, Michael, who is being released from prison; his absent White grandfather, Big Joseph, who won’t acknowledge his existence; and the memories of his dead uncle, Given, who died as a teenager. His mother, Leonie, is an inconsistent presence in his and his toddler sister’s lives. She is an imperfect mother in constant conflict with herself and those around her. She is Black and her children’s father is White. She wants to be a better mother but can’t put her children above her own needs, especially her drug use. Simultaneously tormented and comforted by visions of her dead brother, which only come to her when she’s high, Leonie is embattled in ways that reflect the brutal reality of her circumstances. When the children’s father is released from prison, Leonie packs her kids and a friend into her car and drives north to the heart of Mississippi and Parchman Farm, the State Penitentiary. At Parchman, there is another thirteen-year-old boy, the ghost of a dead inmate who carries all of the ugly history of the South with him in his wandering. He too has something to teach Jojo about fathers and sons, about legacies, about violence, about love. Rich with Ward’s distinctive, lyrical language, Sing, Unburied, Sing is a majestic and unforgettable family story and “an odyssey through rural Mississippi’s past and present” (The Philadelphia Inquirer). "Ghosts, literal and literary, haunt nearly every page of Sing, Unburied, Sing — a novel whose boundaries between the living and the dead shift constantly, like smoke or sand. Set on the Gulf Coast of Mississippi (a place rich in oil rigs and atmosphere, if almost nothing else), the book’s Southern gothic aura recalls the dense, head-spinning prose of William Faulkner or Flannery O’Connor. But the voice is entirely Ward's own, a voluptuous magical realism that takes root in the darkest corners of human behavior ... Ward, whose Salvage the Bones won a National Book Award, has emerged as one of the most searing and singularly gifted writers working today. Grade: A." "However eternal its concerns, Sing, Unburied, Sing, Ward’s new book, is perfectly poised for the moment. It combines aspects of the American road novel and the ghost story with a timely treatment of the long aftershocks of a hurricane and the opioid epidemic devouring rural America." "Staggering ... even more expansive and layered [than Salvage the Bones]. A furious brew with hints of Toni Morrison and Homer’s “The Odyssey,” Ward’s novel hits full stride when Leonie takes her children and a friend and hits the road to pick up her children’s father, Michael, from prison. On a real and metaphorical road of secrets and sorrows, the story shifts narrators — from Jojo to Leonie to Richie, a doomed boy from his grandfather’s fractured past — as they crash into both the ghosts that stalk them, as well as the disquieting ways these characters haunt themselves." "Sing, Unburied Sing is Ward’s third novel and her most ambitious yet. Her lyrical prose takes on, alternately, the tones of a road novel and a ghost story ... Sing, which is longlisted for a 2017 National Book Award, establishes Ward as one of the most poetic writers in the conversation about America’s unfinished business in the black South." "While the magical element is new in Ward’s fiction, her allusiveness, anchored in her interest in the politics of race, has been pointing in this direction all along. It takes a touch of the spiritual to speak across chasms of age, class, and color ... The signal characteristic of Ward’s prose is its lyricism. “I’m a failed poet,” she has said. The length and music of Ward’s sentences owe much to her love of catalogues, extended similes, imagistic fragments, and emphasis by way of repetition ... The effect, intensified by use of the present tense, can be hypnotic. Some chapters sound like fairy tales. This, and her ease with vernacular language, puts Ward in fellowship with such forebears as Zora Neale Hurston and William Faulkner." "[A] tour de force ... Ward is an attentive and precise writer who dazzles with natural and supernatural observations and lyrical details ... she continues telling stories we need to hear with rare clarity and power." "Electric ... a harrowing panorama of the rural South." "Gorgeous ... Always clear-eyed, Ward knows history is a nightmare. But she insists all the same that we might yet awaken and sing." "The novel is built around an arduous car trip: A black woman and her two children drive to a prison to pick up their white father. Ward cleverly uses that itinerant structure to move this family across the land while keeping them pressed together, hot and irritated. As soon as they leave the relative safety of their backwoods farm, the snares and temptations of the outside world crowd in, threatening to derail their trip or cast them into some fresh ordeal .... The plight of this one family is now tied to intersecting crimes and failings that stretch over decades. Looking out to the yard, Jojo thinks, 'The branches are full. They are full with ghosts, two or three, all the way up to the top, to the feathered leaves.' Such is the tree of liberty in this haunted nation." "In this lush and lonely novel, Ward lets the dead sing. It's a kind of burial." "Ward unearths layers of history in gorgeous textured language, ending with an unearthly chord." 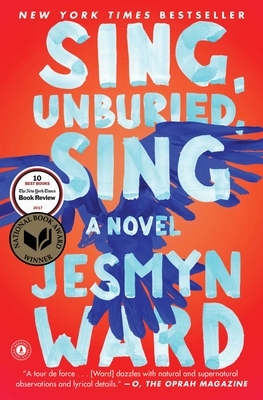 "The heart of Jesmyn Ward’s Sing, Unburied, Sing is story — the yearning for a narrative to help us understand ourselves, the pain of the gaps we’ll never fill, the truths that are failed by words and must be translated through ritual and song .... Ward’s writing throbs with life, grief, and love, and this book is the kind that makes you ache to return to it." "Jesmyn Ward’s new novel is like a modern Beloved, with the cruelty of the criminal justice system swapped in for the torments of slavery ... Sing marks Ward as the sharpest voice in the contemporary conversation around the past’s relationship to the present ... Sing is an expansive endeavor." "If William Faulkner mined the South for gothic, stream-of-consciousness tragedy, and Toni Morrison conjured magical realism from the corroding power of the region's race hatred, then Ward is a worthy heir to both. This is not praise to be taken lightly. Ward has the command of language and the sense of place, the empathy and the imagination, to carve out her own place among the literary giants." "After winning the National Book Award for Salvage the Bones, Ward is back, with an epic family saga, an odyssey through rural Mississippi’s past and present." "In her first novel since the National Book Award-winning Salvage the Bones, Jesmyn Ward immerses the reader in a mesmerizing, cathartic family story ... Ward’s spellbinding prose has a fervid physicality, teeming with the sights, smells, tastes and textures of her native Gulf town of DeLisle, Mississippi, rechristened here as Bois Sauvage. Her images pulse with stunning intensity, seeming to peer into the hidden nature of things, while laying bare the hearts of her characters. More powerful still is the seemingly boundless compassion that Ward demonstrates toward even the least lovable of her creations, expressed through lines that course with pain and love." "Ms. Ward has mastered a lyrical and urgent blend of past and present here, conjuring the unrestful spirits of black men murdered by white men, and never shying away from the blatant brutality of white supremacy ... Ms. Ward’s musical language is the stuff of formidable novelists, and never has it been more finely tuned." "As long as America has novelists such as Jesmyn Ward, it will not lose its soul. “Sing, Unburied, Sing,” the story of a few days in the lives of a tumultuous Mississippi Gulf Coast family and the histories and ghosts that haunt it, is nothing short of magnificent. Combining stark circumstances with magical realism, it illuminates America’s love-hate tug between the races in a way that we seem incapable of doing anywhere else but in occasional blessed works of art." "[As] in everything she writes, Ward’s gorgeous evocation of the burden of history reminds me of Mississippi’s most famous writer, in a novel with more than a trace of As I Lay Dying ... Always clear-eyed, Ward knows history is a nightmare. But she insists all the same that we might yet awake and sing." "[Sing, Unburied, Sing has] a fresh, visceral resonance ... [its] story of grief, racism and poverty isn’t only Mississippi’s story but our country’s. So, too, let us hope, is its story of resilience and grace. "This book is so good that after you read it, you will want to read it again." "[Jesmyn Ward is] one of the most powerfully poetic writers in the country ... Readers may be reminded of the trapped spirits in George Saunders' recent novel, Lincoln in the Bardo, but Toni Morrison's Beloved is a more direct antecedent." "Ward is a visceral writer, her sentences often hitting the reader like a slap across the face ... Ward tells a sweeping tale about atonement and forgetting, shame and responsibility, and failure, sorrow, hatred and acceptance. She does not offer answers. And maybe there are none. But her vital novel shows that we must heed the singing of the past, and raise our voices to help those wounds to heal." "No reason to delay this spell-bound verdict: With Sing, Unburied, Sing, her third novel, Jesmyn Ward becomes the standard-bearer for contemporary Southern fiction, its fullest, most forceful, most vibrant, and most electrifying voice ... While Ward, born and raised in a small coastal community near Pass Christian, Mississippi, is operating within the contours of the Southern literary tradition—in the swampy lilt of her prose, in the scope of her concerns, in the way she entangles setting and character—she is also expanding it, heaving it forward, and revitalizing it in ways that no writer has done in more than a decade." "Ward has deservedly been heralded as Faulkner’s heir, not only because of her poetic prose but also due to the difficult subject matter she delivers to the reader: Making us all look at the U.S. as one would a fragile, yet wounded beautiful bird in one’s hands. Sing, Unburied, Sing is the author’s own take on the American road novel for the 21st century, with themes such as family — more specifically fatherhood — taking center stage." "Jesmyn Ward leads readers into rural Mississippi, to the pain and grief and struggle of a family who can't escape history ... Ward's uniquely lyrical prose ties the family's modern-day struggles to the literal ghosts of Southern history." "In her first novel since the National Book Award–winning Salvage the Bones (2011), Ward renders richly drawn characters, a strong sense of place, and a distinctive style that is at once down-to-earth and magical." "The connection between the injustices of the past and the desperation of present are clearly drawn in Sing, Unburied, Sing, a book that charts the lines between the living and the dead, the loving and the broken. I am a huge fan of Jesmyn Ward’s work, and this book proves that she is one of the most important writers in America today."